A recipe for meat-free 'meatballs' made with aubergine (eggplant), black olives and puy lentils. 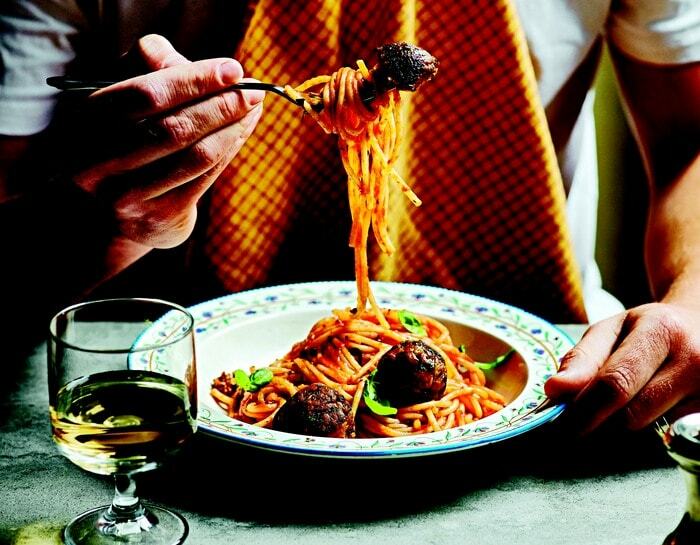 A plate of spaghetti is always so comforting, but add some vegan 'meatballs' and it's taken to another level and something altogether more special. I do wish there was a better name for them than 'meatballs'. They are obviously not meat, these aren't bean based so can't be beanballs, so I find myself stuck for a name that describes them. Of course use the term 'meatballs' and everyone knows what kind of dish to expect. It's the sort of conversation that blows up on a daily basis in the news as the UK gets up in arms about anything converted to a vegan version. The furore over Greggs introducing a vegan sausage roll and a Cornish bakery introducing a vegan Cornish pastry is just silly. It's an extra option to what's on offer. Meat-eaters are not being forced to eat them and they aren't replacing meat products. I think Brexit has sent everyone loopy. 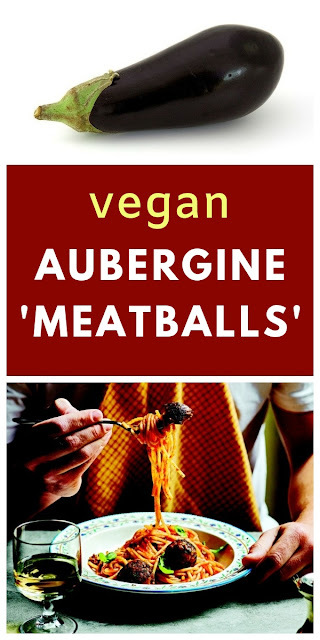 The first time I made veggie meatballs, they were vegetarian and made from a packet mix. That was over 20 years ago. I didn't have the confidence in the kitchen back then and often used packet mixes as the start of a meat-less meatball or veggie burgers. When I started making them from scratch I used kidney beans as a base and called them spaghetti and beanballs. You can see them in the photo above. They are rather tasty! This time around the base of the vegan 'meatballs' is aubergine, black olives and puy lentils plus lots of added flavours. The recipe comes from the new Leon cookbook called Fast Vegan. Each time I'm down in London I visit Leon for lunch. I do love their vegan options. I have a few of their books on my bookshelf too. They are always so gorgeous, full of colour and fun designs along with really easy and tasty recipes. Everything a cookbook should be. Their latest offering is fully vegan. All their other books had some great vegetarian and vegan recipes in them, but everything in this one is vegan. It starts with tips on nutrition, a fold out meal plan, ideas on substitutes, store cupboard essentials, tips on getting a meal on the table fast and tips on eating out as a vegan. I have to say I'm rather impressed with this cookbook, there are some good tips and quite a lot of recipes that I'm keen to try. I particularly have my eye on the pea & potato samosas, leek & mushroom croquetas, sea spiced aubergine, baked buffalo cauliflower wings, satay tofu with pineapple salsa, lemon polenta cake with blackberries and maple & vanilla glazed doughnuts, to name but a few. 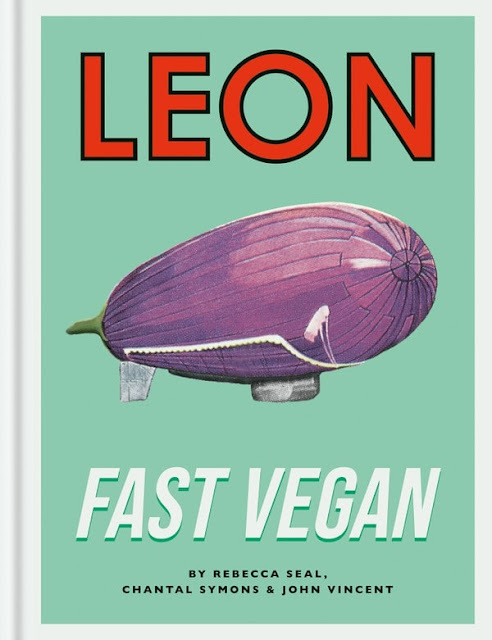 LEON Fast Vegan by Rebecca Seal, Chantal Symons and John Vincent is published by Conran Octopus, £25. Photography by Steven Joyce. The recipe also uses red pepper paste. M&S do a good red pepper dip in a glass jar in their store cupboard section, but if you can't find any, you could just use more tomato puree instead. To save time use ready-cooked puy lentils in a tin or sachet. This is chickpea flour and can be found in the world food section of your supermarket or in Indian grocery shops. 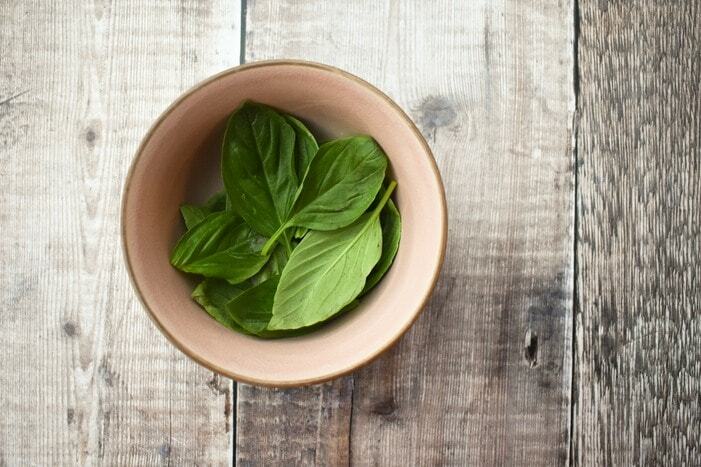 Keep some fresh basil to tear over the dish before serving. It gives a pop of colour and lovely fragrance and flavour. Try this with 2 teaspoons rinsed and chopped capers added to the food processor (you may not need any more salt). Or, to give this dish a more Middle Eastern, rather than Italian, feel, add a large pinch of sumac, ½ teaspoon ground cumin and ½ teaspoon dried red chilli flakes. Instead of pasta serve with couscous or dairy-free pitta bread, tzatziki and salad. Heat the coconut oil and 1 tablespoon of the olive oil in a large heavy-based frying pan over a medium heat. When hot, add the aubergines and cook, stirring, for about 5 minutes, then add the onion and a pinch of salt and sauté for 15 minutes, stirring regularly, until the aubergines are soft, tender and browning and the onion is translucent and also beginning to brown. If the pan seems dry at any point, add another splash of olive oil. Add the garlic, olives, red pepper paste, tomato purée, paprika, fennel seeds, sunflower seeds and pine nuts and cook, stirring, for 3 minutes. Meanwhile, in a small bowl, mix together the ground flaxseeds and water in a bowl and allow to soak for 5 minutes. Tip the aubergine mixture into a food processor with the rosemary, parsley, lemon zest and 50g of the cooked Puy lentils. Blitz briefly, to form a rough purée, but don’t go too far – the balls need texture, and too much whizzing will make them mushy. Transfer the purée to a bowl and add the rest of the lentils, 5 tablespoons of the breadcrumbs, the soaked flaxseeds, the gram flour, baking powder, a generous pinch of salt and some black pepper. Mix well with a spoon, then place in the fridge to firm up for an hour. When ready to cook, heat a splash of oil in a clean nonstick frying pan over a medium heat. First, cook a nugget of the mixture to check its texture and seasoning. If it seems too wet, add more of the breadcrumbs, and add more salt and pepper, if necessary. Using a tablespoon, scoop out pieces of mixture and form into 16 firm, golf-ball-sized ‘meatballs’ using 2 spoons or floured hands. Add the remaining 2 tablespoons oil to the pan and fry the balls gently, in batches, turning often, until they are deep brown and quite crisp on the outside. Remove with a slotted spoon and keep warm while you cook the rest. Meanwhile, cook the pasta in boiling salted water until al dente. To make the sauce, heat the oil in a pan over a low heat. Add the bruised garlic and allow the flavour to infuse into the oil (don’t let it brown) for about 10 minutes. Remove the garlic and add the passata. Bring to a simmer, adding a pinch of salt and pepper. Drain the pasta. Add the basil to the tomato sauce, then add the pasta and toss well to coat it in the sauce. 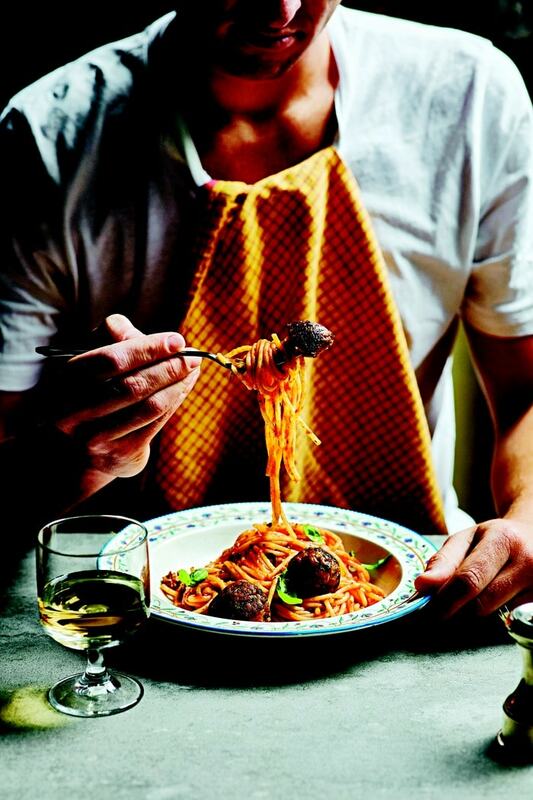 Serve the pasta topped with the warm aubergine balls. binding, so we use it to help firm up the mixture. 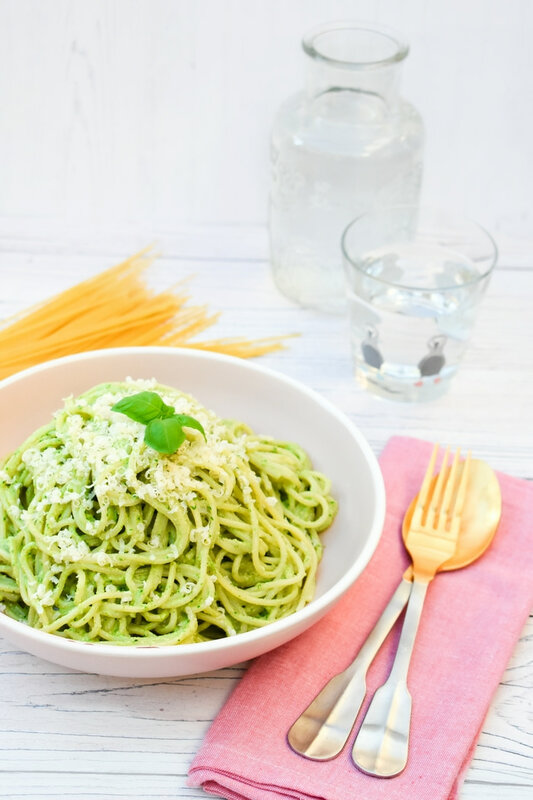 A creamy green sauce for spaghetti that's super silky and coats the pasta beautifully. The pesto is homemade from kale and cashews. It's suitable for vegetarians and vegans. Disclosure: Octopus gifted me a cookbook for review and gave me permission to share two recipes with you. I was not expected to write a positive review and any opinions expressed is my own. 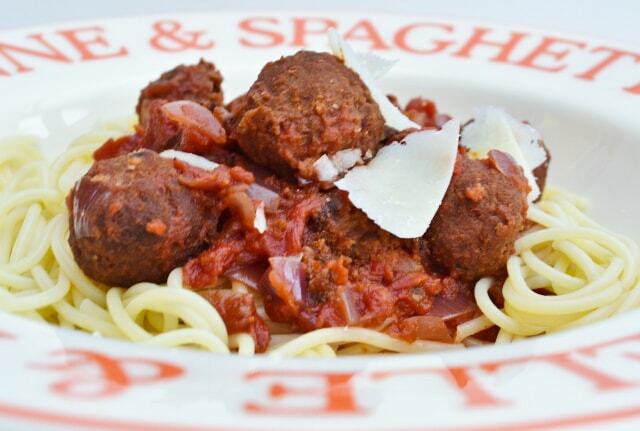 Yes slurpy spaghetti is the best, especially with veggie meatballs. The cookbook is a nice one. You could definitely simplify the recipe Jill. Only use olive oil, skip the red pepper pasta and use extra tomato puree instead and why not choose just one seed and a little dried rosemary. This looks like a great recipe to try as my family tries to reduce our meat consumption! This might just be the recipe for you then Kathi. Enjoy! These were sooo good! They almost fooled my meat loving husband! I am so glad you enjoyed them Tracy. These 'meatballs' look really satisfying and tasty with those flavours. I love to add olives to hot dishes too. Perfect! Funnily enough I only recently came to a love of olives ( my son got there first), but I agree re adding them. These look super tasty and right upy street. I thumbed through the cookbook recently at Waitrose but didn't out put it in my basket. I might go back and do just buy it on your recommendation. PS I make (globe) artichoke meatballs and I had a devil of a time naming them. I think I just put quotes around meatballs! Oh nice idea and yes they are hard to name. 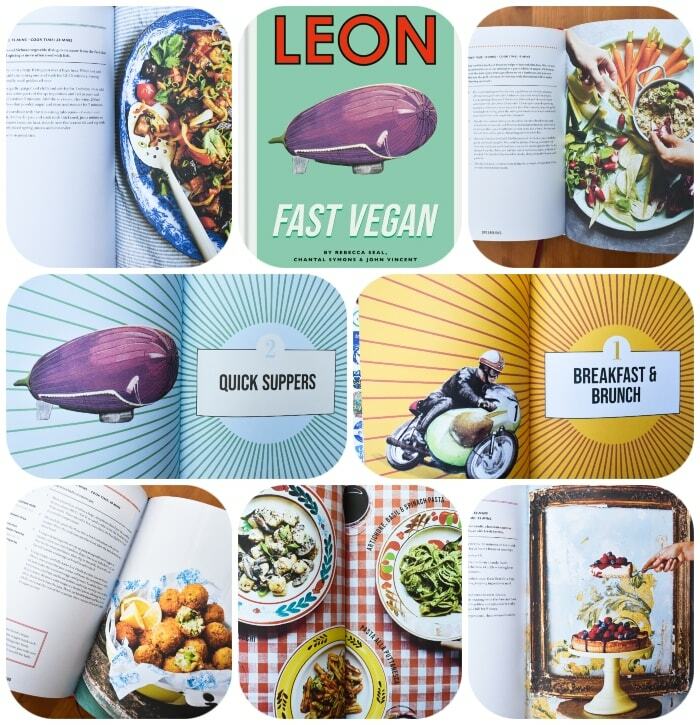 Me, I love a LEON cookbook. So nice to flick through. These look and sound really good. I'm not vegan but don't eat meat every day and would happily polish off a bowl of these - or a Greggs vegan 'sausage roll'! Ha ha, you go girl. I've not tried a Greggs vegan sausage roll but then my health food shop sells such a fabulous range of vegan sausages rolls and pasties. Hi from sunny Adelaide! 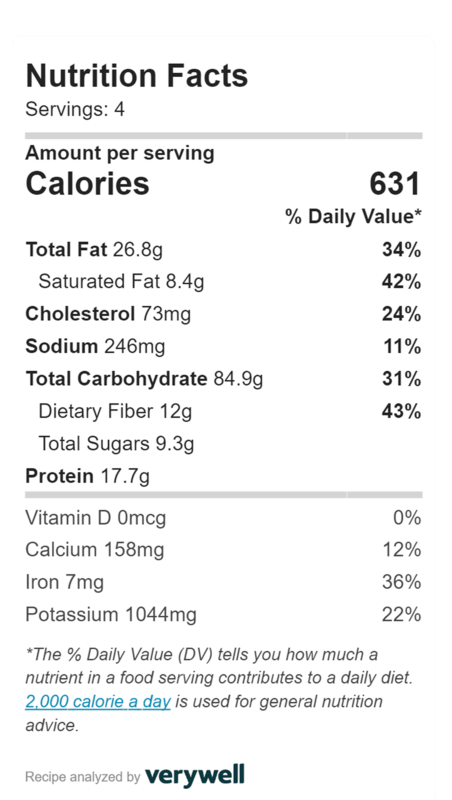 Is the flaxseed mix just an egg substitute for vegan friends? If so - 1 egg enough? So excited to try these! Yes you can skip the flaxseed in water and use one egg for binding if you are not vegan. Although it won't change the flavour or texture particularly.